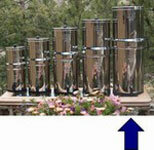 Berkey® Systems are the World’s Most Powerful and Economical Personal Water purification Systems. Berkey® systems are capable of purifying both treated water and untreated raw water from such sources as remote lakes, streams, stagnant ponds and water supplies in foreign countries, where regulations may be substandard at best. So powerful, this system is able to remove food coloring from water without removing the beneficial minerals your body needs. The versatile Big Berkey® system is the ideal for use at home with small or medium-sized families, traveling, out-door activities or during unexpected emergencies. It’s constructed of highly polished 304 stainless steel, and comes complete with two or four purification elements. It utilizes the latest technological advances and has a storage capacity of about 2.25 gallons (8.5 liters). The versatile Royal Berkey® system is the ideal system for use at home with large families, traveling, out-door activities or during unexpected emergencies. It’s constructed of highly polished 304 stainless steel, and comes with two or four purification elements. It utilizes the latest technological advances and has a storage capacity of about 3.25 gallons (12.3 liters). When stored or in transport, the upper chamber nests within the lower chamber for transport and stands only 15 1/4” in height. When in use, it stands 23” H x 9.5” in diameter. The versatile Imperial Berkey® system is the ideal system for use with small to medium sized groups, at home, churches, hospitals orphanages, for outdoor activities or during unexpected emergencies. It’s constructed of highly polished 304 stainless steel, and comes complete with two or four purification elements. It utilizes the latest technological advances and has a storage capacity of about 4.5 gallons (17 liters). 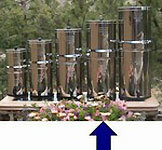 When stored or in transport, the upper chamber nests within the lower chamber and stands only 17” in height. When in use it stands 25.75” H x 10” in diameter. The versatile Crown Berkey® system is the ideal system for use with medium to large groups, at home, churches, hospitals, orphanages, outdoor activities or during unexpected emergencies. It’s constructed of highly polished 304 stainless steel, and comes with two or four purification elements. It utilizes the latest technological advances and has a storage capacity of about 6 gallons (22.7 liters). 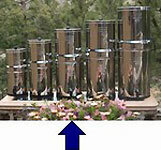 When stored or in transport, the upper chamber nests within the lower chamber and stands only 20” in height. When in use, it stands 30” H x 11” in diameter. 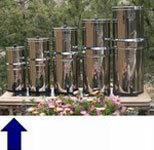 The Berkey Light™ system is designed for use during travel, outdoor activities and during unexpected emergencies. It’s constructed of shatter resistant, high impact strength Lexan® and comes with two purification elements, a base and utilizes the latest technological advances. It has a storage capacity of about 2.75 gallons and when in use it stands 26.5” H x 9” in diameter. It stands 21” H when used without the base (included). Generic Sport Berkey® Portable Water Purifier bottle is the ideal personal protection traveling companion - featuring the IONIC ADSORPTION MICRO FILTRATION SYSTEM. The bottle's filter is designed to remove and/or dramatically reduce a vast array of health-threatening contaminants from questionable sources of water, including remote lakes and streams, stagnant ponds and water supplies in foreign countries where regulations may be sub-standard at best. 22 oz. bottle.